As recently as the early 1970s, very few women in the United States had access to work in newsrooms, press clubs, editorial boards, and radio broadcasting booths. Today, women are employed as writers, producers, anchors, editors, and publishers in nearly every major newspaper, magazine, television network, and radio station across the country. So writes UC Santa Cruz assistant professor of film and digital media L. S. Kim in the 35th anniversary issue of Ms. magazine, on newsstands now. Kim's feature story traces the impact feminists have had on mainstream media over the past three and a half decades. As Kim notes in the article, "although still grossly underrepresented in many areas, women now often decide what becomes news, what goes on the front page, who is given a voice and which stories form the nation's political and cultural narrative." 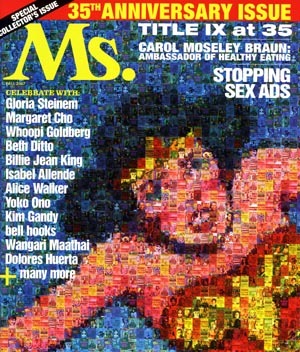 The fall special collector's issue of Ms. also includes comments from a wide variety of feminists including Gloria Steinem, Margaret Cho, Whoopi Goldberg, and Billie Jean King, as well as UCSC's professor of community studies B. Ruby Rich and alumna author bell hooks. They each respond to the question of how feminism has changed their lives in the past 35 years and where the movement is headed. Last year, Kim was asked to join the Ms. magazine Committee of Scholars, made up of 20 professors from universities throughout the country. She said that the non-profit magazine created the advisory group in an effort to reach out to the academic community and provide a forum to bring more attention to feminist issues. Kim recently traveled to Washington, D.C., where the committee met to discuss topics the feminist scholars believe ought to be covered by Ms.
"There's no question that there has been a cultural shift to young women not being apt to call themselves feminists," Kim observed. "One question that the committee grappled with is how do we bring feminism to the forefront for a new generation on college campuses-for the next generation of voters." 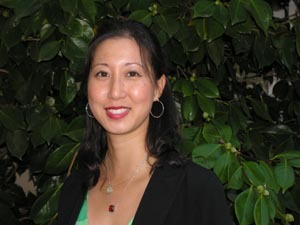 Kim joined UCSC's Film and Digital Media Department in 2002. Her research areas include television studies, racial discourse, postfeminism, media practices, and social change. Kim's work has appeared in such publications as Television & New Media, Journal of Film and Video, Flow, and Jump Cut. Kim noted that she was glad to have the opportunity to convey critical questions she studies in academia to a large public audience. She added that Ms. gave her free reign to pick the topic for her article. "I was interested in the relationship between women and news production--women as journalists on camera, women as subjects of news stories, what stories about women are considered newsworthy, and what difference it makes when women are producers, writers, and executives behind-the-scenes in the production of media," said Kim. Kim added that many of the classes that she teaches at UCSC--such as Asian Americans in Media--utilize a "gender lens." "In general, questions of gender exist in culture, so questions of gender exist in media," said Kim. "Gender is a lens through which you can understand these important issues."